My mother called them “trick rings” and kept them hidden away for the most part. (With five children, I would do the same.) In my early jewelry career, I wanted to recreate them and asked to borrow them. They had such sentimental value to her that she wouldn’t let them leave the house. So I spent some time drawing each individual ring as well as how they were assembled. It was necessary to study the “puzzle” of how they fit together – taking apart and reassembling them many times. 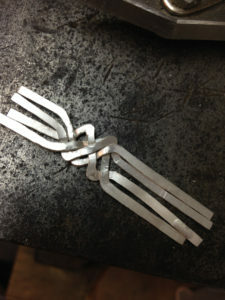 Then I went home to my shop and spent about 12 hours creating my first puzzle ring. My research has found a number of different stories related to the puzzle ring, with most of them having some kind of misogynist angle. Usually some variation of the bridegroom giving the bride a puzzle ring to wear, but without giving her the solution to the puzzle. So if she were to cheat on him and remove her ring, she would be caught. 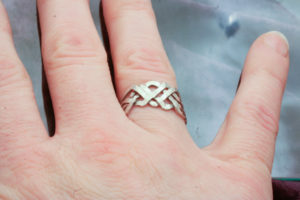 They come in a number of different designs and with many more pieces than the basic 4 part ring my father got. 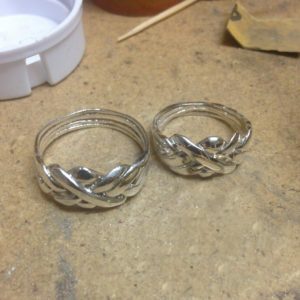 Usually puzzle rings are cast because the pieces need to fit together so well and once the design is finalized, casting is the most efficient and cost effective way to reproduce them. But I had a different idea of forging the pieces together. Hand cutting the pieces from sterling silver sheet, softening the pieces by annealing and then hammering them to fit one another, each ring would be as different as a fingerprint and could withstand the stress of everyday wear unlike the ones my father purchased in Pakistan. With practice, I was able to create them much faster than that original 12 hours. 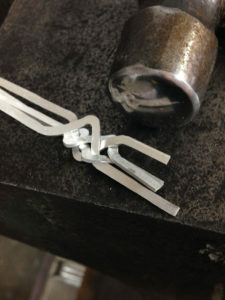 Now, when I get an order for a puzzle ring it is hand fabricated and made to size each time. As part of the purchase I also record a video of the actual ring being assembled for the customers reference in case they have difficulty with it. Once in a while I’ll upload the puzzle ring videos to my YouTube channel for others to watch. You can watch one here. The puzzle ring I wear daily. The puzzle ring is one of my favorite rings to make. I wear one on my right hand almost every day and my hand feels naked without it. It’s always fun to take it off and drop it into someones hand to see their face as it falls to pieces. But the magic is when I can put it quickly back together right before their eyes. Check here for more details about my puzzle rings and how to purchase.